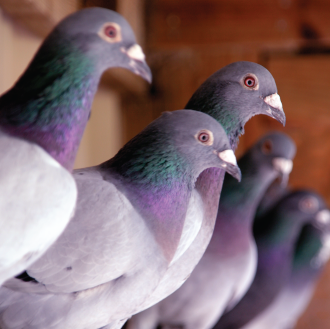 The predecessors of modern racing pigeons were bred for their ability find their way back to their home lofts from hundreds or even thousands of miles away. These birds were used primarily to carry messages. Modern pigeon racing originated in the mid-19th century and has become a popular and even lucrative international sport. At the sport’s beginning, wealthy pigeon fanciers in Belgium raced pigeons as a hobby and began to breed the birds for stamina and speed. These birds were called Voyageurs. The sport depends on the birds’ mysterious “homing ability,” which somehow allows birds released hundreds of miles away to return to their home lofts. The bird that makes it back to the loft in the fastest time is the winner. Some researchers believe that homing pigeons use the sun as a “compass,” or can detect patterns in the Earth’s magnetic field, while research published in Science News and other journals suggests that the birds detect the earth’s magnetic field through magnetoreception in the trigeminal nerve of their beaks. Danny Hutchins has been racing birds for about eight years. “I just woke up one morning and told my wife I wanted to buy some racing pigeons. It’s something I can do in my backyard until I’m ninety years old. I enjoy it,” he said. “In the U.S., first-year birds are released 300 miles from the loft to fly home. After birds have flown in a 300 mile race, they ‘graduate’ to the 600 mile races, which they will continue until they are no longer used for racing,” said Hutchins. The average flying speed of the bird is about 30 miles per hour, but birds reach speeds up to 59 miles per hour over short distances. Pigeon racing is big money around the world. The most famous pigeon race takes place in South Africa. The Sun City Million Dollar Race pits 4,300 pigeons from 25 countries against each other for a share of $1.3 million in prize money. In one Oklahoma race, birds compete for $300,000 in prize money. In addition, premier racing birds can bring hundreds of thousands of dollars when sold. 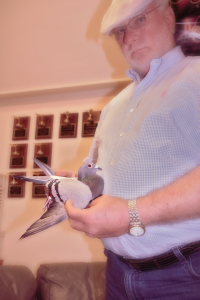 A breeder in McKinney, Texas, recently bought the fastest bird in the history of the Barcelona Pigeon Race for $180,000. Hutchins owns Hutchins Services, a plumbing, electrical and air-conditioning service in Sherman and also operates Hutchins Loft, where he raises, breeds and trains racing pigeons. While he has enjoyed great success in races around the country, he said the birds are still just a hobby. A hobby he recommends. Masters Of Long Distance And Marathon Pigeon Racing’. Although no longer racing the author in this publication reveals his love for the sport and especially his love for our racing thoroughbreds. And known as a champion of pigeon racing throughout the world especially at the long and marathon races his book is a valuable contribution and its contents will add to the thought of those fanciers who seek to development the sport throughout the planet especially at the longer distances.